Hi Savvy Southern Style readers! My name is Brandi and I blog over at Nest of Bliss, where you will usually find me puttering around our century farmhouse with my fiancé & our three dogs! I cannot tell you how excited and honoured I am to be contributing to Kim's "My Favorite Room" series today. 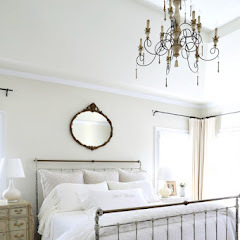 I'm a big fan of Savvy Southern Style & was pinching myself when she asked me if I would share my favorite room! Although many may assume my favourite room is my kitchen (since it receives a lot of attention on my blog), but I would have to say my favorite room is my open living/dining room space. As I took photos of this room I was asking myself why this room is so special to me. I suppose there are many answers... This is our first house, and the very first room I ever redesigned. This room is a constant reminder of the faith my fiancé had in me when we bought this old farmhouse, and the constant support he continues to give when it comes to following my dreams. This room was also the beginning to my blog. A blog was something I had wanted to start for years, and when we finished this room I finally took the leap... and never looked back. This room makes me reflect on all of the families who have lived here before us and the memories that were made in this house. This house will always be our "first" - and what a wonderful first home it's been. I aspire to decorate with pieces that have meaning to us, such as our farmhouse table my dad built from plans I showed him... I'll never part with it! Or the antique paddle we bought from a hoarder's barn when we lived in military housing... what a fun day that was! An antique box that Jeff's mother lent to me that I store candles in... Driftwood collected from my family's cabin on the lake... All meaningful. This mantel was a flat mantel that we purchased secondhand. My fiancé built it out and created a hearth for it. It was one of our first building projects and is the focal point of the room. It's so fun to decorate! We are now ready for the next chapter of our lives, and our home is for sale --- I can't wait to see what the future has in store for us. It's been truly wonderful sharing my favourite room with you. I hope your home is filled with happy memories as well. :) Be sure to pop over & visit me over at Nest of Bliss sometime soon. You are always welcome! 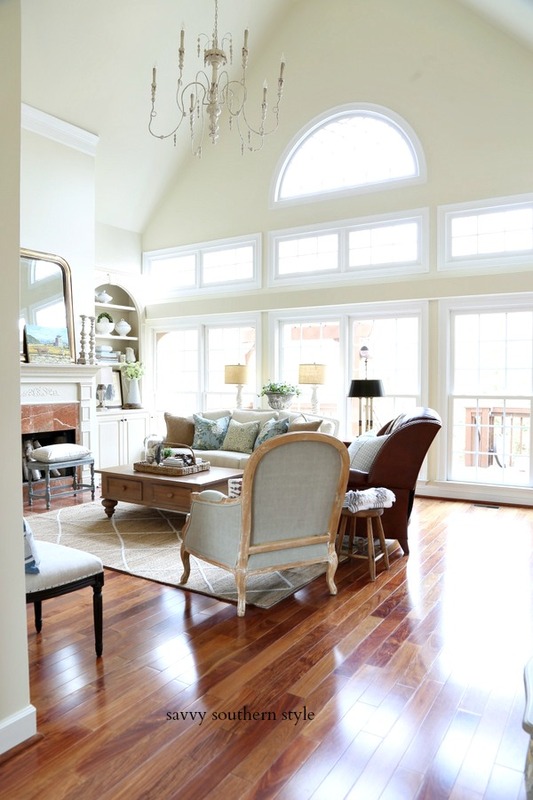 Thank you Brandi for opening up your home and sharing your favorite room. That table built by your dad is amazing and the whole room is just gorgeous. How exciting to move on to a new place. 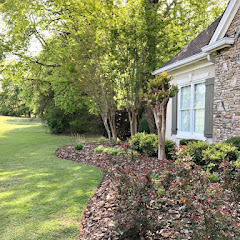 If y'all don't know Brandi and her blog Nest of Bliss be sure to pop over and say hello and look at more of her beautiful home. Miss any past favorite rooms? Catch up on all of them here. I love the bright look of all the white! Brandi did a great job with her first house. 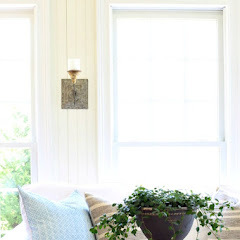 The room has certainly come a long way from its original state...I love Brandi's blog and her style...she has done an amazing job along with her fiancee to make their first house a home. I have admired her table that her dad made for her...how so very special....Great feature today Kim...and good luck on the sale of the house Brandi...I am sure it is bittersweet....Have a great weekend Kim and Brandi. This is absolutely one of my favorite rooms! So comfortable, light and inviting. Love Brandi's blog! Brandi as you already know I think your home is amazing! Love your living room. You made quite a difference in there. what an amazing transformation!!! Beautiful, I so love the soft color palette!!! 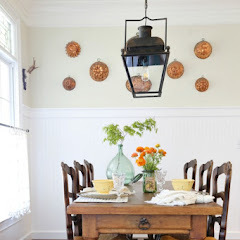 Brandi has done a wonderful job adding to the charm of her old farmhouse. Her dining table is a beautiful focal point in her dining room. What an amazing home. Just love the character in the farmhouse and the attention to detail is wonderful!! Happy weekend to you both!! I am not familiar with Nest of Bliss. 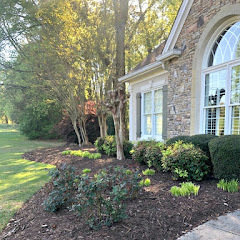 Thanks for featuring Brandi and her beautiful home. I have to go over to her blog to read more. Great Choice Kim. Brandi is a girl after my own heart with her white living room. So pretty. Nicely done! I think the table and the mantel are outstanding. What a beautiful home. They have put so much of themselves in this home and it really shows. It's a great space. Can't wait to see what the next chapter has in store for them. I have not seen this blog before. I love her style! I think she's done a great job with transforming that space. I can't believe the before and after! I'll have to go visit her now. The room is peaceful and serene...it lend to dreaming and comfort for the soul. Wishing you all the best Brandi for the next chapter of memories in your life. What a great feature and beautiful home. Love that farm table that dad made, beautiful. Thanks for sharing!!! How bright and pretty it is. Brandi, I luv your favourite room. Going Over to see the rest. Beautiful dining room chairs. Very pretty home. That is a drop dead gorgeous room! Very pretty!